The key to selecting the right distributed I/O solution for your application no longer lies in the type of communication network but the scalability and performance of the distributed I/O solution itself. With most distributed I/O products supporting a majority of the popular types of open distributed networks, the packaging, size and I/O type are what is important to the application. In reviewing any application you must breakdown your I/O types and count by location to determine the class I/O required. There are three major types of I/O packaging classifications. Slice I/O has become one of the most popular choices for distributed I/O based on its I/O granularity giving the user the ability to have a the correct count and I/O type for 2-50 I/O points at the most cost effective level. 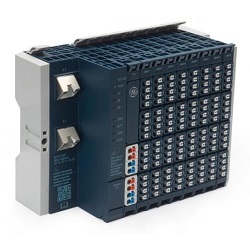 Single station I/O has been around from the beginning of the introduction of open distributed networks and allowed for users to have I/O groups of 4, 8 and 16 point per module allowing for medium I/O count stations from 8-200 I/O points. Rack mount I/O solutions are characterized as the carryover from the conventional I/O expansion rack used in traditional PLC architectures except the parallel expansion has been replace with a digital network connection. This solution is still widely used and offers great economy when dealing with medium to large I/O count stations from 64-500+ I/O points. What does GE Automation & Controls offer?